I had the pleasure of attending this sold out show at the Room 5 Lounge in Hollywood California, this past Wednesday, June 25th 2014. I’ve attended a couple of shows at this venue in the past, and let me say that it is ALWAYS a good time. It’s a small intimate place, which makes it that much better. It was a sold out show, making it a little crowded in there, leaving not many places for people to sit. Regardless, I think everyone enjoyed the music we got to endure for the night. 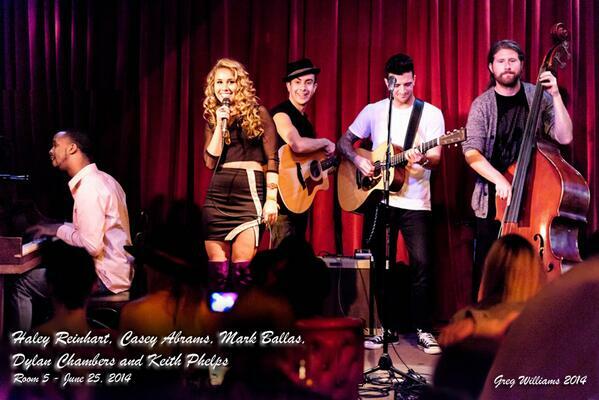 Dylan Chambers, Mark Ballas, Haley Reinhart & Casey Abrams performed a 2 hour set, from 8-10pm. Dylan Chambers took the stage first, and started out the show on the right foot! Then it was Haley’s turn. It was a surprise for Haley to see her main keyboardist Keith Phelps at the show, he was in town visiting and she had no idea he was coming. She asked him to help out for a few songs since he was there, which of course he did! Haley sang a few of her originals, and even spoiled us with some new covers like “Sitting On The Dock Of The Bay” and “Gee Baby, Ain’t I Good To You”. Her voice sounded absolutely incredible, I think it’s sounding the best we’ve ever heard! Mark Ballas then took the stage and rocked out, he did an awesome job showing off his musical talents, including shredding on the guitar! Casey was last to go on, he entertained the crowd with some covers and originals, and of course invited Haley back onto the stage to sing his song “Stuck In London” together. That lead to them giving us an awesome 1 minute preview of Haley’s new song for her upcoming music video “Show Me Your Moves” which I’ve previously posted here. The 4 of them all have great chemistry performing together. The show was a lot of fun, and it was sad that it had come to an end… But wait! There’s more! Dylan, Mark, Haley & Casey decided to take the show to the streets! A crowd had formed around the 4 of them on the sidewalk right outside of the Room 5 Lounge, and they put on almost another hour’s worth of a show for us. We got to hear covers of some Michael Jackson, Justin Timberlake, Sam Smith, and more! People in the crowd were filming, dancing, and singing along, making enough of an impact for the cars driving by to slow down and stop, to try and see exactly what the hell was causing all this ruckus on the sidewalk close to midnight on a weekday. The night was a blast, it was truly a one of a kind show that I was lucky enough to see. From the show inside, to the show outside, they all performed their hearts out and gave all of us who were there some great memories. This might only be the start of many more shows to come from these 4, we shall see what the future holds! There were many amazing videos filmed from this night by multiple people, if you have yet to see any of them, please, check them out! You won’t regret it! Wow! that was GREAT thanks I felt like I was there! Come take it to the Street in Chicagoland! Haley Reinhart sings “Show Me Your Moves”!